Operate an elevator in an old apartment building. Pick up and drop off residents where they want to go. A line graph shows where the elevator traveled over time. 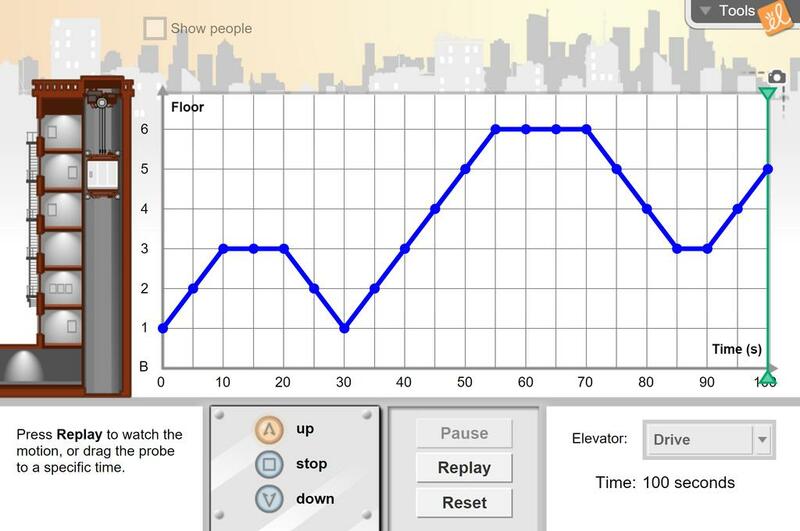 Operate the elevator either by using the standard up and down controls, or by building a graph to program where you want it to go. Find and interpret the coordinates of a point on a graph. Connect the motion of an elevator to its representation on a line graph. Line with a positive slope represents elevator going up. Line with a negative slope represents elevator going down. Horizontal line represents elevator at rest. Steeper lines represent faster motion. Interpret the story of motion depicted by a line graph. This Gizmo made teaching net change a breeze. Students could visualize positive and negative changes with this challenging activity! This gizmo was a great introduction to my topic: Linear graphs and slopes.